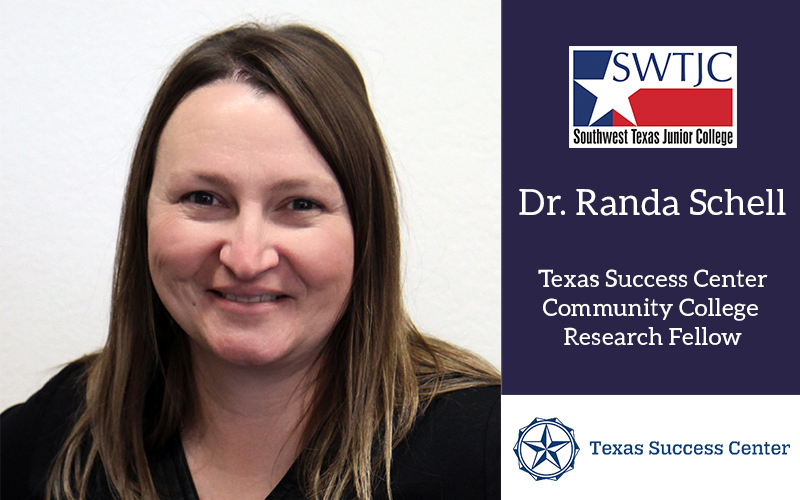 SWTJC Student Engagement & Success Director, Dr. Randa Schell was recently selected to serve as a Texas Success Center Community College Research Fellow by the Texas Success Center (TSC), a member of the national Student Success Center Network. Schell was selected from a competitive pool of applicants and will hold this position until Aug. 31, 2020. According to their website, the fellows conduct research studies and related activities to build the knowledge base concerning Texas Pathways reform efforts, enhance the impact of community colleges’ reform efforts, and increase capacities of community college focused researchers. This knowledge development work informs the development of practitioner-oriented guidance and tools and shapes training, technical assistance, coaching, and professional development related to pathways. Knowledge development work focuses on questions of particular interest to college practitioners and policymakers in the state. “We are excited about this new partnership and look forward to the next 18 months working and learning together,” said Cynthia Ferrell, Ph.D., Texas Success Center Vice President. TSC creates a coherent, statewide framework for action and supports the 50 community college districts in the state as they evaluate, align, and integrate their work to increase student success.